Our WipeDrive solutions can help you manage your company's end-of-lifecycle storage hardware in a secure, cost-effective, and environmentally-friendly manner. Our core solution, WipeDrive Enterprise, allows you to permanently erase all data from hard drives, removable media, and mobile devices. See SystemSaver and SecureClean for partial drive deletion. 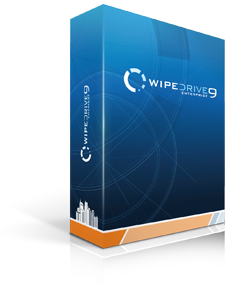 WipeDrive is the world's only EAL 2+ disk wiping software. It has passed dozens of certifications for efficacy and security and is used by many government agencies and other large organizations. WipeDrive provides an audit trail so that the date, time, and status of data erasure can be verified and proven. Physical destruction of drives costs $8-10 per drive, and WipeDrive typically costs less than half of this amount. Unlike physical drive destruction, drives wiped with WipeDrive can be easily and securely re-used within the organization or donated to charitable causes. There are no landfill by-products. WipeDrive fully erases all data on the hard drive such that data recovery is forensically impossible. SystemSaver erases all sensitive information, leaving the operating system and programs intact. SecureClean periodically cleans unneeded information without harming programs or retained data. WipeDrive Mobile erases all data on your iOS devices and then restores the latest operating system. VeriDrive allows you to verify the deletion of data, regardless of what program you use to wipe it.